Dreaming of the Green… what are we living in Colorado? We can’t be that far behind, can we? 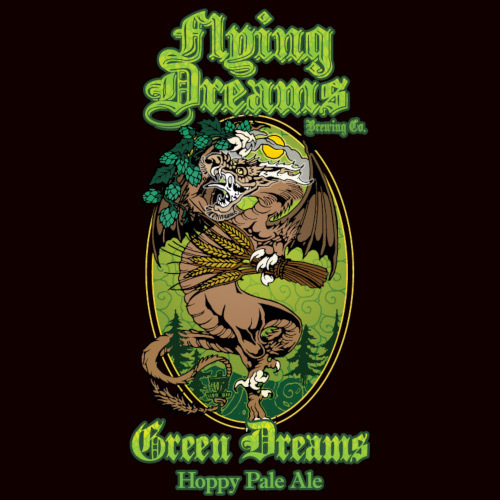 Green Dreams Pale Ale is an American Pale Ale of epic proportions, or an IPA that barely squeaks by… some might even call it a session IPA, but I digress. Dry, light bodied, and low in bitterness, yet so bold in flavor and aroma. Grapefruit, lemon, bitter orange, herbal, grassy, resiny… a serious hop party. It begs the question: is there a beer in between a Pale Ale and an IPA? The answer is yes – this one!